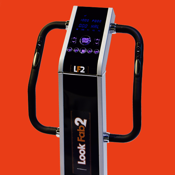 Welcome to the Look Fabulous 2 App, and find out why everyone is talking about the whole body vibration plate that allows you to "Lose a Dress Size in 3 Weeks". Using this App will allow you to track and monitor your inch loss. Here at Look Fabulous 2 we also have our own unique dietary capsule to assist with weight loss which can also be monitored via this app and purchased via paypal in 1 week, 3 week and 5 week tubs. Share your progress with us at Look Fabulous 2 Ltd where we will share your feedback with others via our blog.